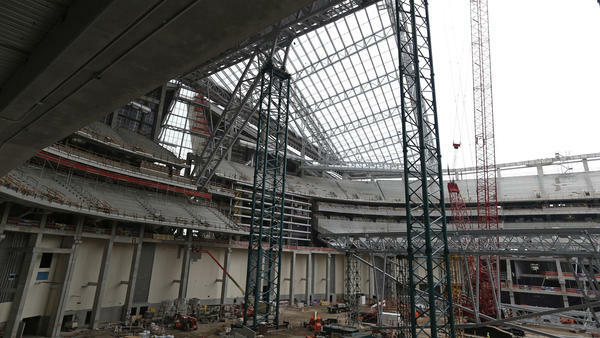 The public share to pay for construction of a new Minnesota Vikings football stadium is reportedly $498 million. As an absolutely impossible thing happened to Serena Williams on the way to becoming the absolutely guaranteed Grand Slam champion, it reminds us once again, on the field of play, there is no sure thing. But off the field, some things are, to coin a word: un-upsettable. At the top of the un-upsettable list is that in American city after American city, either the voters or their elected tribunes will put up oodles of the citizens' hard-deducted tax money in order to fund a new stadium for the benefit of a filthy-rich team owner. Never mind that this has long been recognized by all sorts of economists as bad business for the cities. Municipalities all over the country keep forking over for these athletic Taj Mahals. Click the audio to hear the rest of Deford's 2 cents on this fiscal topic. If the Emerald City had sports arenas, they could hardly have been more lavish than the arenas in some U.S. cities today. Here's commentator Frank Deford. FRANK DEFORD, BYLINE: As an absolutely impossible thing happened to Serena Williams on the way to her becoming the absolutely guaranteed Grand Slam champion, it reminds us once again, on the field of play, there is no sure thing. But off the field, ah, some things are, to coin a word, un-upsettable. At the top of the un-upsettable list is that in American city after American city, either the voters or their elected tribunes will put up oodles of the citizens' hard-deducted tax dollars in order to fund a new stadium for the benefit of a filthy rich team owner. Never mind that this has long been recognized by all sorts of economists as bad business for the cities. Municipalities all over the country keep forking over for these athletic Taj Mahals. There's only one reason for this self-destructive physical behavior, what would be called blackmail in less polite company. The team owners threaten to move their franchises unless the cities or states ante up for a new playground. It's no secret. The Taxpayers Protection Alliance has zeroed in on the NFL, pointing out that 29 of the league's 31 stadiums have enjoyed billions in public financing. This is all the more obscene because football stadiums are the worst excesses. Not only are the pigskin castles monstrous, but they lay idle most all days of the year. At least arenas can be used for non-sports presentations, and baseball parks host a multitude of games. Anyway, on it goes. Egregiously, Governor Mark Dayton of Minnesota agreed with his legislature and gave a third of a billion dollars to the Vikings. In Missouri, Governor Jay Nixon is ready to build big to keep the Rams from moving to Los Angeles. And then, last month in Wisconsin, to bribe the NBA from leaving Milwaukee, Scott Walker, the governor, signed a bill to finance a new arena for $250 million. That same figure, by the by, is what Governor Walker cut out of the budget of the University of Wisconsin. Ah, but there's something nicely symmetrical about this. It was only in 1953, in that very same Milwaukee, that County Stadium opened, the first stadium in the country financed with public funds. And, of course, the Boston Braves immediately scrammed out of Boston for Milwaukee. And it hasn't stopped since; nor, notwithstanding logic, will it. Transcript provided by NPR, Copyright NPR.